Join us Monday evenings for Bingo! A variety of games: A jackpot game worth $3,000, progressive games, and more for cash prizes. Bar and food menus available. Date: Mondays, except federal holidays. Time: Card sales begin at 4:30 p.m. 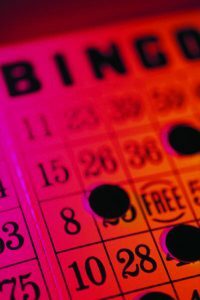 Regular session starts at 6 p.m.
We play Bingo Bonanza all day, every day. Purchase tickets from the cashier or bartender. The Colorado Pizza & Sports Grill is a HAPPENING place! Watch sports and specially televised sporting events like the Ultimate Fighting Challenge. Play games on its Wii system. Or shoot a game of pool. The menu offers a nice alternative to lunch and evening dining. Enjoy Steak Night on Tuesdays when we feature an 8 ounce rib eye for just $10 or a 10 ounce hanger steak for $14. And for your discriminating palate, the Colorado Pizza & Sports Grill offers a selection of 130 exotic beers from all over the world. Enjoy a pint of the Draft Beer of the Week. Kick back and relax. Pizza Delivery – We deliver to your home or office on base, 11 a.m.-8 p.m. Mondays – Fridays and 4-8 p.m. Saturdays. To place your order, call 719-574-8863.